Today’s technology provides so much information that learning the essentials about an important topic like vaccination can be overwhelming. The Centers for Disease Control and Prevention (CDC) has launched a new interactive guide to help navigate the vaccines recommended at each stage of life. This resource teaches families about vaccine-preventable diseases — like flu, whooping cough and HPV cancers — and highlights the recommended timing for key immunizations. Did you know that when you get vaccinated, you pass along some of the protection to your baby? If you are pregnant or plan to become pregnant, vaccination is an important step in keeping you and your baby healthy. Pregnant women should always get a yearly flu shot. In the third trimester of every pregnancy, you should get the whooping cough vaccine (Tdap). Talk to your doctor about other vaccines you may need before, during and after becoming pregnant. Many of the diseases that vaccines prevent can be especially serious for young children. Making sure your babies get all the recommended vaccines on time is the best way for you to protect them from 14 serious diseases before the age of 2 years old. Check the interactive guide for the full recommended immunization schedule that is designed to protect your babies early, before they are exposed to potentially life-threatening diseases. 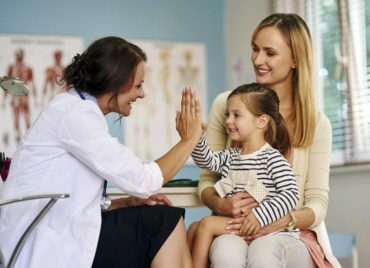 From ages 3 through 6, your children need additional doses of chickenpox (varicella) vaccine; measles, mumps, rubella (MMR) vaccine; polio vaccine and Tdap vaccine, as well as a flu vaccine every year. From ages 7 through 10, your children should continue to get a flu vaccine every year, by the end of October if possible. Keep in mind that schools may require a certificate of immunization to enroll. If your children have missed any vaccines, work with your doctor or nurse to make sure they get caught up. As protection from childhood vaccines wears off, adolescents will need booster shots to extend immunity. They will also need protection from other diseases before their risk of exposure increases. Preteens need four vaccines to provide protection now and in the future: Tdap vaccine to protect against tetanus, diphtheria and whooping cough; human papillomavirus (HPV) vaccine to protect against cancers caused by HPV; meningococcal vaccine to protect against meningitis; and a yearly flu vaccine. If you have adolescents or teens who plan to travel outside the Unites States, check to see if additional vaccines are recommended. Also, make sure they are up-to-date on all their vaccinations before they head to college. While you are busy keeping your children’s vaccines up-to-date, don’t forget about yourself! All adults need a flu vaccine every year by the end of October, if possible, as well as a tetanus and diphtheria (Td) vaccine every 10 years. Healthy adults 50 years and older should get a shingles vaccine. Adults 65 years or older need one dose of pneumococcal conjugate vaccine (PCV13) followed by one dose of pneumococcal polysaccharide vaccine (PPSV23). Adults younger than 65 years who have certain health conditions like heart disease, diabetes, cancer or HIV may also need one or both of these vaccines. Other vaccines may be recommended at various stages of life based on health conditions, job, lifestyle or travel habits. The CDC’s interactive tool provides families with information on the importance of on-time vaccination and a detailed look at the vaccine schedule. Find it at cdc.gov/vaccines/growing, along with a guide you can print and bring to your next doctor’s visit.